Having periodontal disease, or gum disease, means that you no longer have the luxury of procrastinating when it comes to caring for your smile. The disease will continue to progress and affect more of your gum tissues with increasing severity, and in severe cases, it could cost you one or more teeth. Because of its potentially severe consequences, periodontal disease can seem complicated to treat. However, at our Encinitas/San Diego periodontal office, we offer several advanced, minimally invasive treatments to restore your good periodontal health and help you avoid the more extreme consequences of it. The root causes of periodontal disease are specific types of oral bacteria that can be found in your dental plaque. As they cling to your teeth, some of these bacteria work their way underneath your gums, preferring the region of your teeth roots instead of the upper crown portion. From underneath your gums, these bacteria can release toxins and other harmful substances that force your gum tissues to recede from your teeth roots. Removing these bacteria is paramount to your periodontal health, and ozone (oxygen) therapy helps boost this process by neutralizing the anaerobic bacteria. In the fight to eradicate harmful bacteria, ozone therapy is just one of many tools. However, when it comes to healing your gums, such preventive measures may not be enough. Your gums are like the rest of your tissues in your body – they contain platelets that enable and promote their self-healing factor. After removing harmful bacteria, we can recommend platelet-rich therapy to boost that factor within your gums, allowing them to recover and heal faster and more successfully. This can also help reduce the extent of further treatment that you might need to fully recover from gum disease and secure your smile’s long-term health. With a boost in their platelets, your gums have a much better chance of recovering, but depending on the extent of your disease, you may have areas of tissue that cannot heal. 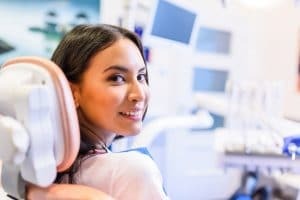 For the sake of the rest of your smile, your treatment may include carefully trimming away the excessively diseased tissue, which we can often perform with the help of advanced laser technology. Using lasers instead of traditional scalpels helps ensure greater comfort, convenience, and precision during the procedure, as well as minimizing any trauma to surrounding areas of the tissue. When your gums are compromised, the best way to restore their health is with minimally invasive treatment from your periodontal expert. For more information, schedule a consultation with Dr. Kania by calling her periodontal office in Encinitas/San Diego, CA, at (760) 642-0711.